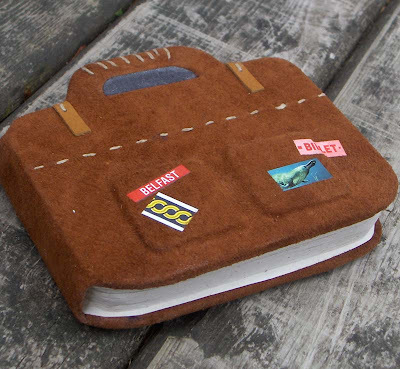 This suitcase book was made for the swap by Rhonda of MyHandboundBooks. 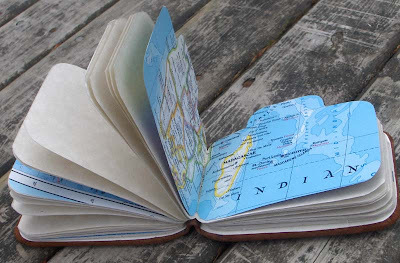 This is a hardcover case bound book covered with brown suede leather and embellished with raised areas to resemble pockets, and decorated with bits of ephemera to suggest a well-traveled bag. Most of the pages are blank parchment text paper, with parts of a world map cut up for the centre spread of each section. Yes, it is fabulous! I'm the lucky recipient of Rhonda's gorgeous book - it's the perfect size and I love the map pages! Thanks Rhonda. Oh my gosh, this book is amazing! !